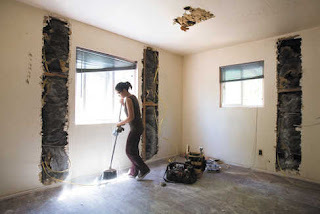 Tim Sleeper, son of Bob and Mary Sleeper of the Beverly's family helps Cal Poly engineering professor Roya Javadpour and her project management class with their annual home renovation service project in San Miguel. More than 40 students in the PolyHouse project are renovating the home of a disabled 16-year-old girl and her aging grandparents. According to Javadpour, the teen was born with a heart defect and uses a wheelchair. She became severely and permanently disabled after falling into a coma. Her primary caregivers are her grandparents, who have parented more than 20 foster children. The home needs basic upgrades, such as fixing the heating system, and repairs to make a bathroom accessible. 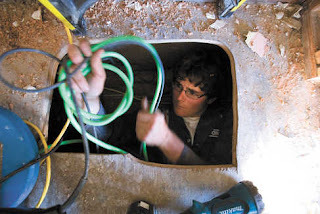 Cal Poly student Tim Sleeper works on piping under the floor of a home in San Miguel.